Good news! Higher short-term interest rates mean higher potential returns on your cash. This is not going to make or break your retirement plans, but it may be worth a 30 minute exercise to review the interest you are earning on your cash accounts and consider your best alternatives. If you have $30k in a savings account paying 0.10%, you may be leaving $420 on the table with no additional risk. That will cover you Netflix subscription and then some. Before we get into your best cash alternatives, let’s step into the classroom for just a few minutes. An important concept in economics is the ‘Yield Curve’ (see image below). ‘Yield’ is a fancy way of saying ‘Interest Rate’, and ‘Interest Rate’ really means the cost of borrowing money. The Yield Curve is a simple line graph that shows us the interest rates for loans over a range of timeframes, from very short (1 month) to very long (30 years). The short-term rates tell us something about what interest rate we might earn on cash and other liquid savings accounts. The long-term rates tell us something about the interest rates on loans such as mortgages. We like to keep an eye on U.S. Treasury interest rates because they are a helpful ‘baseline’ rate. This is a ‘baseline’ because loaning money to the federal government is considered a very low risk investment (they can raise taxes and print money to pay you back). If you loan money to a corporation, for example, we would expect the interest rate you receive to be higher than the U.S. Treasury rate. This compensates you for the additional risk. The difference between the interest rate on the loan to the corporation and the loan to the U.S. Treasury is referred to as the ‘credit spread’. The term ‘credit’ is the same as when we refer to our own ‘credit scores’. The lower your credit score, the higher the interest rate. The same goes for lending money as an investment. Investors demand a higher interest rate when lending to high risk corporations with bad credit scores. Comparing interest rates to the ‘baseline’ is a helpful way of judging how much we are being compensated for the risk we take. Now back to discussing your portfolio. 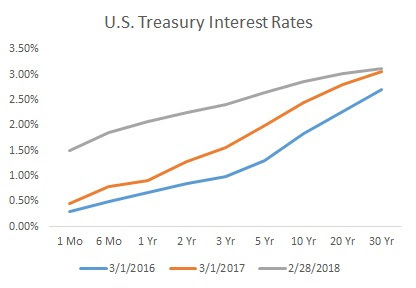 Did you notice from that chart that the very short-term interest rates have increased much more dramatically than the long-term rates? This is reflected in much higher interest rates on CDs and savings accounts, and slightly higher interest rates on mortgages. Here are some of the best rates I found this morning on FDIC insured savings accounts and short term CDs. I usually reference www.bankrate.com, but keep in mind that this is an advertising site and they are promoting some banks over others. How can you earn even higher rates on short term loans? You guessed it… take more risk. For example, a 1 year loan to a corporation with a ‘AA’ credit rating currently pays about 2.50%. That additional 0.50% over the 2.00% CD rate is essentially the ‘credit spread’ we referenced earlier. You can see for yourself using this nifty tool from Fidelity.